Wow, I didn't even know that I had come close to a hundred post, but my blog yesterday put me there. I'll give myself a nice little pat on the back for that. Hopefully during this time you have been entertained, enlightened, and maybe even blessed by something you have read. This is my space, so the post can be all over the place, and I'm okay with that. I was going to post about how I woke up with an inbox full of you "Urgent" messages, but when I got here and saw that I was at the century mark, I threw caution to the wind and went with the happy and light as opposed to the mundane and dark. I still have a mountain of laundry to do, and dinner to cook (with no idea what to prepare), but none of it feels as daunting as it did this morning. Today I gave Mr. Thompson the cloths I knitted for the new baby, and I went to pick the older girls up from school and we went to the Book Fair. They had a good time, and so did I. Dinner is still up in the air, but I've almost got a handle on that. The laundry definitely needs to be done by 5:00 though, so I must leave you now. Have a great rest of the day, and I'll talk to you tomorrow. I'm back!!!! So soon you say. What could the occasion be? Well thanks to Kristin aka Homegrownrose on Ravelry we've been challenged to blog everyday through the end of March. How's that for a kick in the pants, uh... I mean motivation. So to kick things off, let's start with a little transparency. I'm in the process of "trying" to lose some weight, well more exactly some inches. My weight is fairly normal, but the fat in places it didn't use to be is starting to bother me. So I decided that I wanted to fit into the bikini that I bought two years ago, and have never worn. Well that's all well and good, except I have a slight eating problem. That being said, I eat whatever is around, literally. Take today for example. My Mocha Moms group had a meeting and I do the snacks, and fortunately they were healthy, because we had Sarah from the Diabetes Association of Atlanta, Inc. speaking to us about nothing other than....that's right diabetes and healthy eating. Well, we had lovely croissant sandwiches with Rotisserie style thinly sliced chicken breast, with lots of fresh veggies, and baked veggie chips, and a vegan Red Velvet cake from Meri's. So you say what's the bad in that. Well I had two sandwiches. One while the ladies were here, and then another when the girls got home from school, about 2 hours later. Then I had a small (and that is the truth) slice of cake. But for dinner. ARGH!!! I had a bowl of oatmeal, a bowl of ramen noodles, and two orange rolls. Not what I had planned, that would be the nice, lovely, healthy portion chicken fajita, with black beans and corn. Sad thing is I almost ate that too. Where does this out of control, neurotic eating behavior stem from you ask. Well I hate having leftovers and the fridge is full of them. Nor can I stand to throw food away, it seems to wasteful and I just wasn't raised to throw out good food. Too many of those "poor children in Africa, who would appreciate this food" speeches in my youth I suppose. Sometimes I eat, emotionally, as like a crutch, a support when I'm down, food is a pick me up. <-That is so not a good attitude toward food. Enough confession, I am exhausted. Don't worry though, I won't go and raid the kitchen, I've got my glass of water and if anything I'll have some trail mix later. We'll catch up more tomorrow. Sometimes, I forget. (That is a widely known fact to friends and family.) And well, I was thinking the site is so lacking pictures, well that's because I forgot that I could upload pictures straight from my phone with relatively little hassle. Although I must say I don't like the camera on this new phone as much as my last which is weird, because they are both made by the same company; however I digress. Here are a few pictures of FO's that you probably haven't seen. 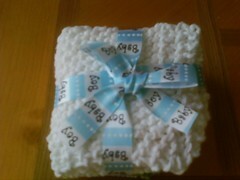 Very Simple Dishcloths for Little Buddy's Dance teacher. Sorry Heather and Elica, I'm still not that quick to undertake the projects you suggested. But I think I am getting faster. A Cabled baby hat for a community service project our Girl Scouts did over the holidays. How could I not post this. I put it on Ravelry, but not here...strange. 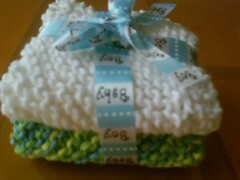 And a washcloth I made for Bear as a stocking stuffer. I got the pattern from 200 Knitted Blocks. Okay, so I'm supposed to be practicing project monogamy, but it is not working. Things keep coming up. Being completely honest, I'm still working on some things that were supposed to be gifts for Christmas, but obviously that didn't work out. I'm trying to finish them up so they can be gifted at later times over the course of this year. However, at every turn, there's a new something that needs to be made, since in my efforts to be considerate and thrifty, I have decided to make all (well most) gifts this year. I just found out my mailman's wife had a baby the latter part of last year, (which explained his absence). Now Michael tells me that Little Buddy's dance teacher is having a bridal shower next weekend, and all the students are invited- well we can't just go empty-handed (I would never teach my children to go to any occasion without a hostess gift of some sort). Call me old-fashioned, but showing up to someones door without even ______ (something appropriate for the event at hand) is just rude. So now I'm trying to work on things that are quick and meaningful, and that can be made using the yarn in my stash. But the mailman's wife had a boy, and I have lots of pinks and purples because I have 3 daughters. The dance teacher may get a pair of um..., legwarmers? Is that too cliche'? 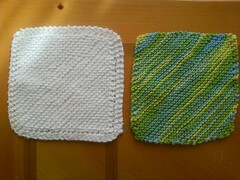 I wanted to do some nice dishcloths but I haven't found a pattern that wouldn't take me forever to make multiples of . What can I do about all these pop-ups? I'll not be able to be monogamous if all these different obstructions keep getting in the way. Oh and did I mention that I know at least 4 ladies that are expecting over the course of the year. Two of them relatively soon, and within weeks of each other. Aaaggggggghhhhhhhhh!!!!!!! Help please.